It's early morning and a team of more than 20 professionals cram around a long table in a dark room, peering at slide after slide of black-and-white mammogram images crossing the screen. What remains the same throughout each case, though, is the intensity of the discussion and the wide breadth of comments based on the specialty of the medical professionals who are weighing in. There are radiation oncologists, surgical oncologists, medical oncologists, breast cancer nurse navigators, radiologists, geneticists and pathologists, all with their pagers on silent. Some of the questions on the table: Does this patient have the right diagnosis? What's the best treatment? What are other lifestyle considerations? Do they need cryopreservation – freezing of their eggs to preserve fertility? What are their wishes in how they get treated? Occasionally, the professionals disagree. The discussion deepens, as the options are debated. 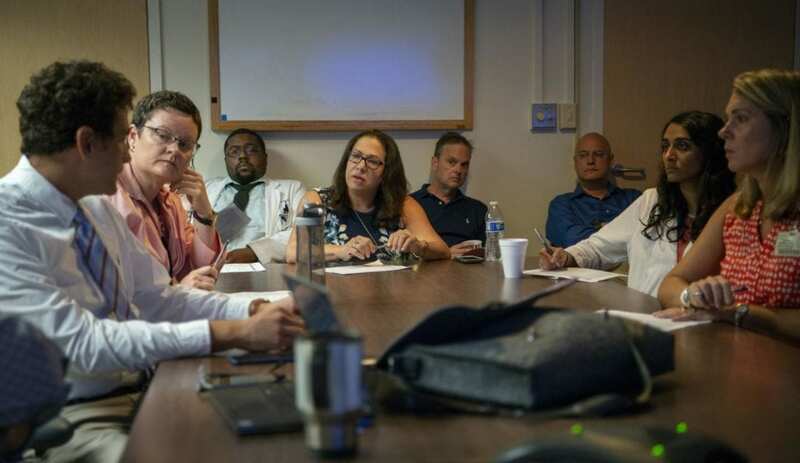 At the head of the table guiding the discussion is surgical oncologist Nancy DeMore, M.D., of the Hollings Cancer Center at the Medical University of South Carolina. She, more than most, knows the value of a multidisciplinary tumor board. It's one reason she and colleagues decided to conduct a study. Published in the Annals of Surgical Oncology, the study looked at the value of a second opinion for breast cancer patients referred to a National Cancer Institute-Designated cancer center with a tumor board. Researchers concluded that a review by a multidisciplinary tumor board at an NCI-Designated cancer center changed the diagnosis for 43 percent of the patients who presented for a second opinion for breast cancer. "Our results show our second opinion really does provide value in potentially changing the diagnosis, which in most cases will eventually change treatment," she said. "I would hope this study would empower patients to seek a second opinion at centers that specialize in oncology." Researchers in this retrospective study analyzed breast cancer patients who had been diagnosed at an outside institution and who received a second opinion at MUSC Health from August 2015 to March 2016. Radiology, pathology and genetic testing reports from outside institutions were compared with reports generated after a review by a multidisciplinary tumor board and a subsequent workup at MUSC. The review included 70 patients seeking second opinions. A total of 30 additional biopsies were performed for 25 patients, with new cancers identified in 16 patients. Overall, 16 or 22.8 percent of the 70 of patients had additional cancers diagnosed (either in the same breast, the contralateral breast or a metastasis to an axillary lymph node). "Those findings would drastically change care," she said. "In addition, we found the pathology review changed in 20 percent of people. And 16 percent of people who met guidelines for genetic testing by the National Comprehensive Cancer Network (NCCN) guidelines for genetic testing had not been referred for testing." In other areas of the nation where similar studies were done, the percentage of change in diagnosis resulting from second opinions was not as high as what was shown in this study. DeMore said this could be attributed to the higher level of rural areas in the state and that Hollings Cancer Center is the only NCI-Designated cancer center in the state, she said. In South Carolina, there are only three academic medical centers, which are centers with a hospital that works in conjunction with an academic institution. Less than 10 percent of the patients in the study who came for a second opinion had their first opinion at an academic medical center, DeMore commented. "There are other states where there are many top medical centers available to patients," she said. "Whereas in our state, there are only a few places in the state that have this type of expertise. In this state, we are the only NCI-Designated Cancer Center, and MUSC has the only radiology residency program." That means MUSC's radiology residency program has the leading experts in the field hired to teach the next generation, and they are doing research to set the next standard of care, she said. "All of our radiologists at MUSC have done extra training with breast fellowships in breast imaging. All they do is breast imaging. The majority of our surgical oncologists have done surgical oncology fellowships, and the medical oncologists specialize in just breast medical oncology, and our pathologists have done fellowships in breast pathology. We're a center with really specialized care." Many people may not know the level of specialty care when they seek care, and patients can be in a state of shock when they get a cancer diagnosis. "It's important to pause and regroup and make sure you have the right plan." Denise Garcia, M.D., a general surgery resident and first author on the study, said that the findings surprised her because she's just learning about the important role that a review by a tumor board can play in getting the right diagnosis. "This made me value that process even more after doing the research on this. I actually recommended this to my family members. The discussions that go on in that room are very valuable. People are bouncing stuff off one another and really listening to one another. It's a really positive process." Garcia said she knows some people are hesitant to offend their physician by asking for a second opinion. "It's your health, and you have a right to go hear what other people are saying. It also can give you more confidence in your treatment." DeMore agrees. "As a surgeon, when someone asks me if they should get a second opinion, I always encourage it."